There are a few things that can be done to keep your leisure battery in top condition. Leisure battery maintenance is very important. Batteries should be clean, cable connections need to be clean and fully tightened. Many battery problems are caused by dirty and loose connections. A leisure battery can be serviceable, these are called flooded batteries. Or non-serviceable, Sealed, AGM or Gel. Serviceable leisure batteries (flooded) need to have the fluid levels checked regularly and only at a full charge as the fluid level will always be higher at a full charge. Low batteries should be topped up with distilled water. Do not overfill battery cells especially in warmer weather as the natural fluid expansion in hot weather will push excess electrolytes from the battery. To prevent corrosion of cables on top post batteries it is advisable to use a barrier such as Vaseline or grease on the connections. Most people don’t know that most corrosion is caused by the gases from the battery condensing on metal parts. Non-Serviceable batteries do not require the fluid levels to be checked or topped up. Leisure batteries are different in their construction than engine cranking batteries and will store their charge much more efficiently. A fully charged leisure battery sat on a shelf next to a fully charged engine cranking battery will maintain it’s charge for a longer period of time as its self discharge rate is much lower. This is due to the plate construction within the battery. – Flooded batteries – These have caps on them which can be removed so that the fluid (electrolyte) can be replenished. 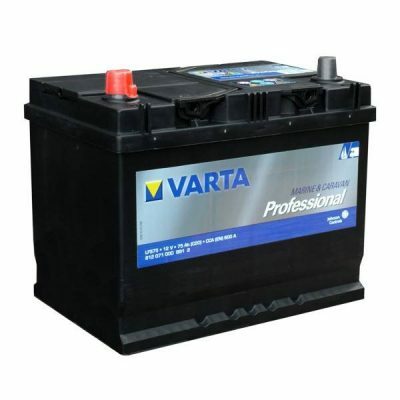 These batteries require maintenance at fixed intervals for optimum performance. –Sealed batteries– The internal construction of these batteries is much the same as a flooded battery, however they are non serviceable (also known as maintenance free). These batteries do not have removable caps and the electrolyte cannot be topped up. – AGM – Absorbed Glass Matt batteries have a glass mat between the cells suspending the electrolyte. This keeps the electrolyte in close proximity to the plates and in theory enhances both the discharge and recharge efficiency of the battery. AGM batteries store better and are less likely to suffer corrosion than a sealed or flooded battery. – Gel – Gel batteries are very similar to AGM batteries, however the electrolyte is not suspended by another medium as it has an additive which makes it set up or stiffen. Gel batteries have a lower charging voltage than other types of battery, they require the charge controller to have an option for charging Gel batteries and for it to be set up correctly. Over charging these batteries is very bad for them and will almost certainly lead to poor performance or premature failure. Gel batteries can be more efficient in hot weather applications or for very deep cycle applications. One of the biggest factors in battery performance is temperature. Cold temperature increases the resistance in the battery and effectively reduces it’s capacity. Charging voltage also changes with temperature, this is why the charge controllers have temperature compensation built into them. Charging a battery helps to raise its internal temperature and thus reduce the effect of the cold weather on it, a solar panel will act as a trickle charger through winter and will help with this. Another consideration is that any draw, such as alarms etc. will be pulling power out of the battery, without anything to address this a decent leisure battery could be drained in a month from the alarm alone through winter. A solar panel will replace the power used by the alarm and maintain the battery state of charge. Please bear in mind that not all alarms draw the same amount and it is advisable to check the power consumption and consider this when sizing a panel, if you would like any assistance with this please feel free to call us on 01903 213141. Before laying the vehicle up for the winter it is advisable to fully charge your batteries, this will make sure that they are in the very best condition they can be before being unused for a prolonged period of time. A solar system connected to a leisure battery through winter will act as a trickle charger and maintain the battery at its float charge level. It is also advisable to disconnect any non-essential loads from the batteries if the vehicle is going to be static for a long period of time, this will completely remove any parasitic loads which you may be unaware of. In general it is a good idea to provide leisure batteries with a maintenance charge as over time a battery left to its own devices will gradually lose charge. A battery discharged below 50% state of charge (SOC) will be damaged if the energy is not put back in quickly. Failure to do this will result in the battery sulphating which will in turn affect its performance and longevity. If a battery is going to be unused for a long period of time it would need to be fully charged before being put into storage and unless a trickle charger is connected will need a maintenance charge every 4-6 weeks. Having solar connected will act as a trickle charge and can maintain the battery sufficiently without the need for any other charging. – Bulk Charge – In this stage the battery voltage has not yet reached boost voltage and 100% of available solar power is used to recharge the battery. – Boost Charge – When the battery has recharged to the Boost voltage set point, constant-voltage regulation is used to prevent overheating and excessive battery gassing. – Equalization Charge – Certain types of leisure batteries benefit from periodic equalization charging. This effectively stirs the electrolyte, balancing battery voltage and completing chemical reactions within the battery. Equalization charging increases the battery voltage beyond than the standard fully charged voltage to excite the electrolyte. Equalization charging is not carried out constantly so as to avoid overheating or gassing the battery.Equalization – Certain types of batteries benefit from periodic equalization charging. This effectively stirs the electrolyte, balancing battery voltage and completing chemical reactions within the battery. Equalization charging increases the battery voltage beyond than the standard fully charged voltage to excite the electrolyte. Equalization charging is not carried out constantly so as to avoid overheating or or excessive battery gassing. Please note that a when you a purchase a new leisure battery it will have been sitting in store on a shelf for an unknown period of time. For best performance it is advisable to charge new batteries before use.